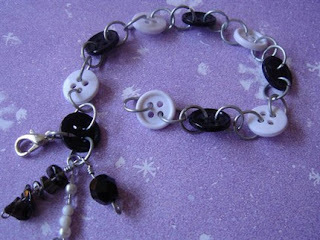 Ulixis Crafts: Treasury! And a Christmas Cracker Swap!! 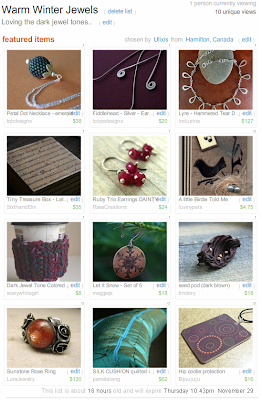 I just made it into treasury west! :) I'm so addicted to this! This one features lovely shades of brown with winter jewel tones - such as emerald, ruby and sapphire. So pretty!! I realize it's been forever since I've written about myself... I promise to post an update soon! I have a ton of pictures I'm sorting through to decide which to post, so as soon as I'm done... I've also been quite busy writing my thesis (or pretending to) ~ the rough draft is due in less than 2 weeks. Yikes! 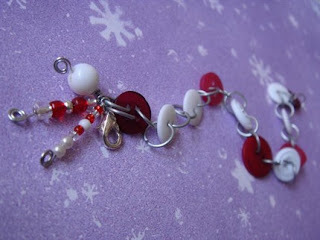 I'm also participating in a Christmas cracker swap, hosted by Carolyn over at Magpie-Pixie. My swap partner is Amy, from Ruby Moon Art. I'm really excited! I've pretty much decided what to stuff the cracker with, and how to decorate it, but I haven't been able to find a snapper yet... I might have to just buy a pack of 10 crackers at the drug store, just for that. Seems like a bit of a waste, but what's a cracker without the snap? So I've been quite crafty for that, and I've made a couple of necklace and earring sets (one for me, my mom... and I should be posting one soon), a few notebooks, bracelets... I'm slowly posting them on Etsy. Why don't you check out my newest listings: cranberries in the snow and black and white.